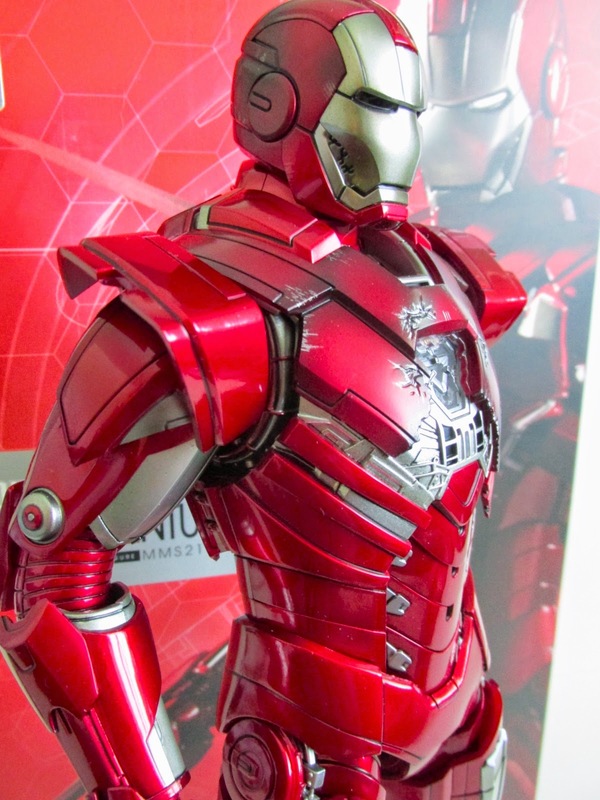 It looks like Christmas has come early...well if you like Hot Toys Iron Man collection. 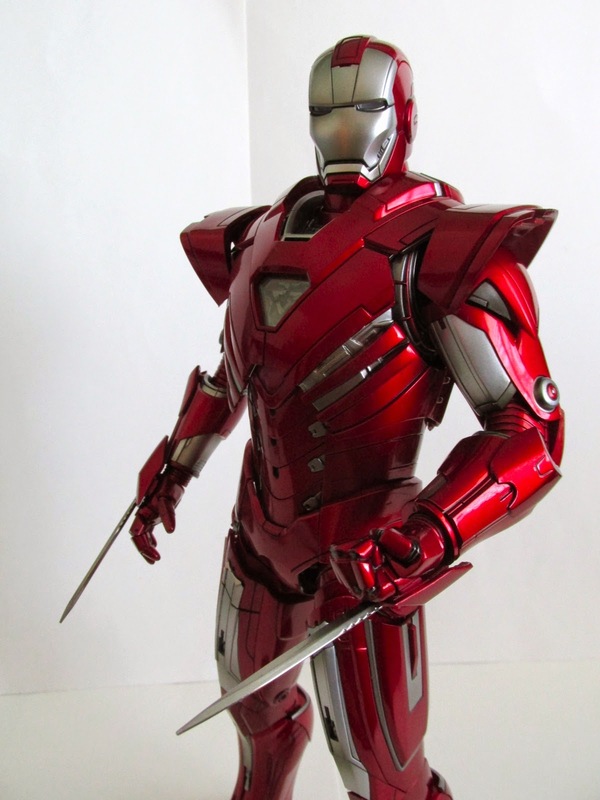 I forget what Iron Man we are on now but this is the latest release of the Iron Man armors. The Silver Centurion is one of the classic armors Iron Man wears in the comics, and it is nice to see it get represented in movie form. 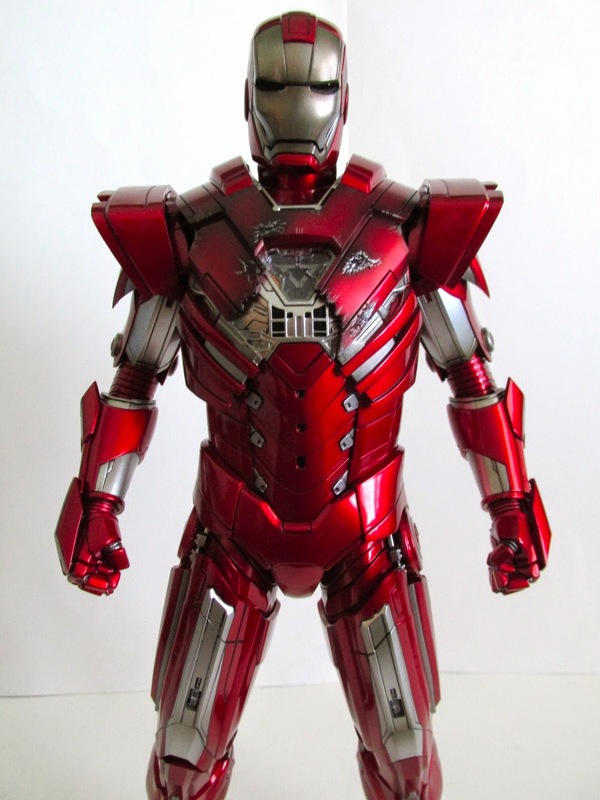 Unlike past Iron Man Armors, this armor is made from new parts and has a whole new body to work on. This armor has a much wider build than other armors and in comparison feels a lot bulkier compared to say the Mark VII. Accessories wise he comes with two metal arm blades, alternate helmet with face sculpt, battle damaged chest plate, three pairs of hands, base, and a dynamic rod. 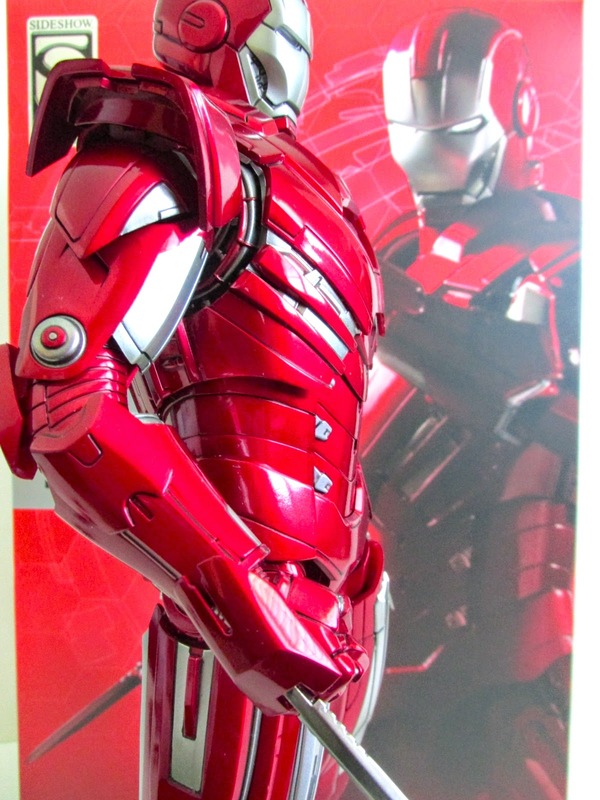 If you got the exclusive version, you also got the exploded Mark XLII helmet. The Mark XLII helmet has a realistic plastic flame sticking out of the eye. 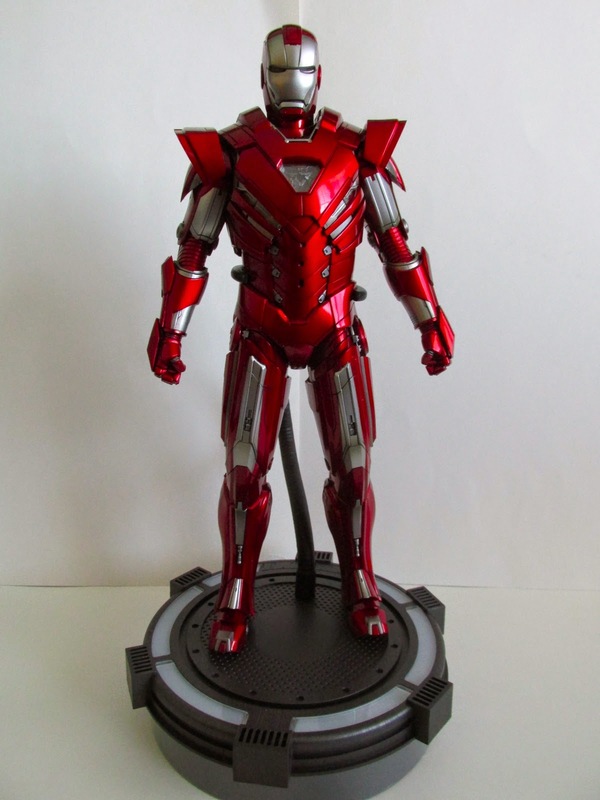 It doesn't add much to this figure but if you have The Mechanic Tony Stark or other Iron Man armors this will be a nice accessory to those figures. One nice upgrade to this armor are his hands. The gauntlets are attached to the hands and switching out the hands with the proper gauntlets is not necessary since they are now attached. This is most likely due to the design of this specific armor, but it is still a nice touch and means less fiddling around with small parts. The battle damaged chest plate works nicely and looks great when put on with the battle damaged helmet. Like the Mark XLII, the battle damaged helmet includes the face sculpt complete with cuts and blood. This is the same face we have been getting on all Iron Man armors, and it works great for this line. Sadly, The Mechanic head will not fit on this armor since the joints don't fit to the armor. Unfortunately, the base does not light up and with mine the screw for the dynamic rod broke. I'm not sure why it broke but the washer that would hold the rod is now rolling inside the base. Another quip I have are the metal blades. The blades have a hard time fitting into the slots on the closed fist hands and just don't stay in the way they were designed to. Just be careful with the base and rod as well as putting in the metal blades into the fist. You don't want to break any of those. Overall, I'm happy with this figure and glad to own a classic armor Iron Man has worn in the comics. 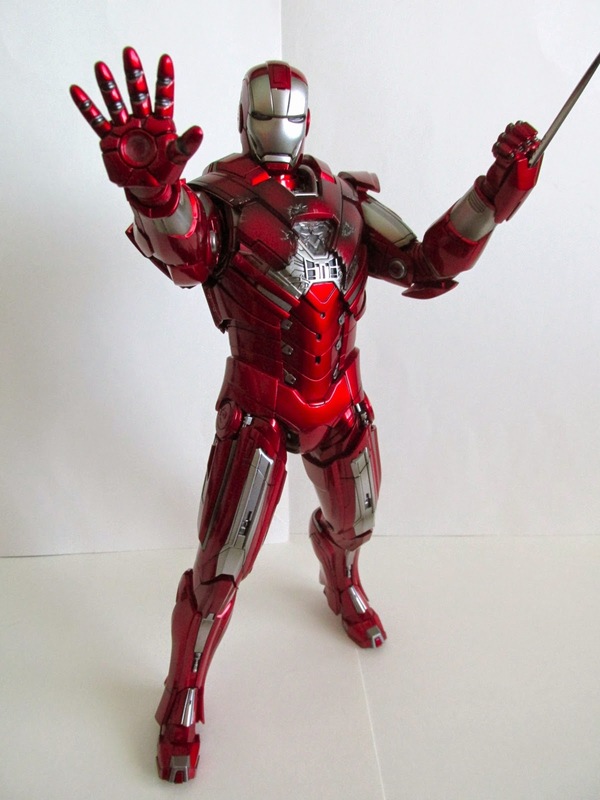 Still, it would be nice to get all Iron Man figures done in die cast. 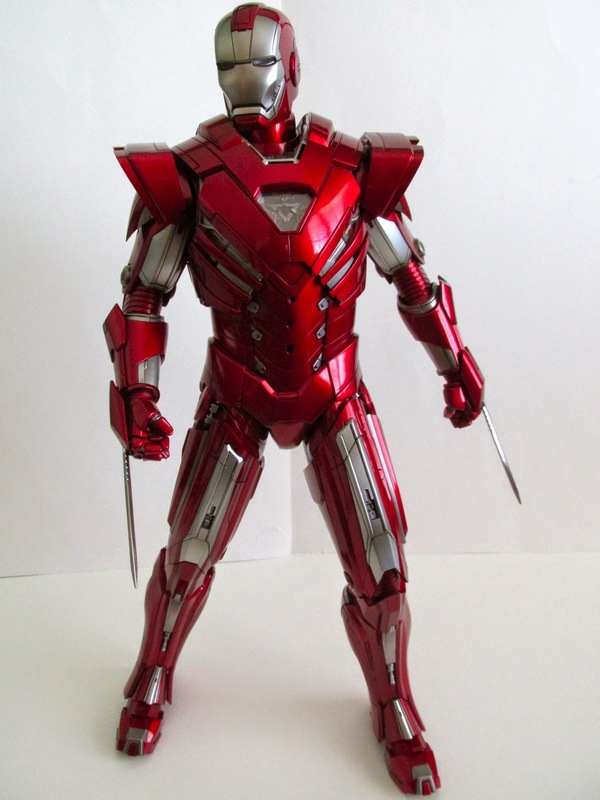 Sure it would be expensive, but you can feel the difference with this plastic figure compared to the Mark XLII. 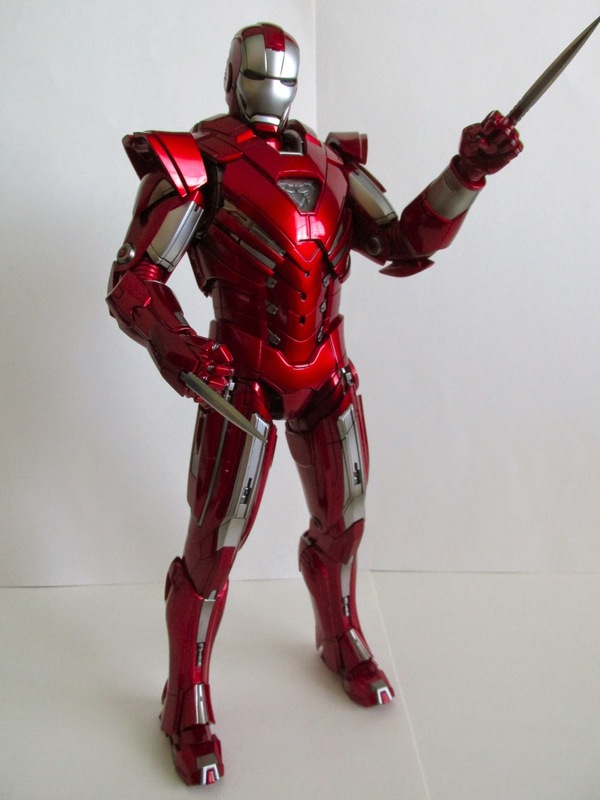 If you love Iron Man and all his 42 armors, then you need the Silver Centurion for your collection. Unfortunately, the Sideshow Exclusive is sold out but you can still buy the regular edition at Sideshow Collectibles. Silver Centurion can be pre ordered here!